Ethiopia is the leading recipient of donated content from Books for Africa, according to an update from the 30-year-old charity. A charity based in St. Paul, Minnesota, Books For Africa, has announced that in a record-breaking year, more than 3.1 million educational, library, and law books have been shipped to 18 African countries, a 26-percent increase over last year. 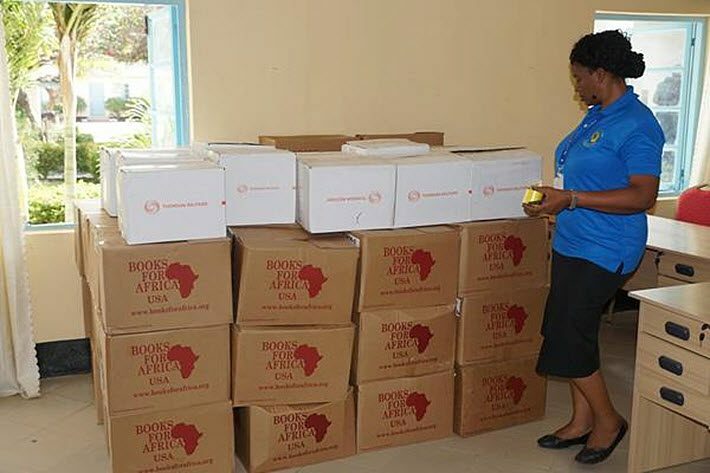 With a reported value of more than $33 million, Books For Africa states that it has shipped nearly 636,000 more books than it did last year. Its books shipments have included 10 libraries in the Jack Mason Law & Democracy Initiative. That initiative’s co-chairmen are Kofi Annan, former UN secretary-general, and Walter Mondale, former US vice-president. The nonprofit’s fiscal year ends June 30. In addition to books, Books For Africa reports that it has also shipped 93 computers and e-readers containing 223,000 digital books. Books For Africa’s promotional information classifies it as the largest shipper of donated text and library books to the African continent. Since its founding in 1988, organizers say, the program has sent 39 million books to 49 different countries. Books For Africa has worked in partnership with a number of organizations to ship and distribute more books, including the Peace Corps; U.S. embassies in Africa; Out of Print Books; Better World Books; USAID (United States Agency for International Development); Worldreader; Thomson Reuters; and Little Free Library. The organization is currently making plans to celebrate its 30th anniversary in January with a hike up Table Mountain near Cape Town. The hike is to be led by Tom Warth, the founder of Books for Africa, who started the organization in 1988 after visiting a new library in Jinja, Uganda, and finding that it had few books to offer.